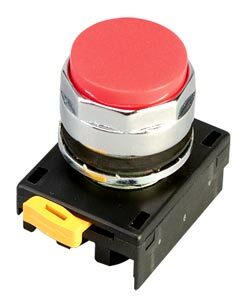 The 22.5 mm industrial heavy-duty pushbutton line offers a wide array of functional, smartly styled illuminated and non-illuminated pushbuttons, selector switches, push pulls, alternate action and twist-to-release operators. The complete line also includes transformer, full voltage, resistor, LED or neon light units. The EM22 Metal Series is a rugged line of metal construction 22.5 mm (0.88") pushbutton devices. The devices are an extension of the industrially proven E22 Series heavy-duty double insulated 22.5 mm pushbutton family. EM22 Series operators are heavyduty zinc die-cast construction plated with a corrosion-resistant chromate finish. Operators are complete with a very durable chrome plated metal bezel. Indicating light units in the EM22 Series feature smartly styled round lenses that enhance their appearance and brightness. All EM22 Series operators are compatible with existing E22 Series contact blocks, light units, accessories and enclosures. EM22 Series metal operators and indicating lights are grounded when mounted to metal panels through the toothed mounting nut. They are not grounded when mounted to plastic panels. Ingress Protection: UL (NEMA) Type 1, 2, 3, 3R, 4, 4X, 12 and 13 IEC IP65 Note: Ratings apply when mounted in enclosures with the same ratings.